Social interaction is one of the many features in Dragon Mania Legends. As Trainers are able to face other Trainers in competitive settings, they are also able to befriend one another, providing them with numerous and unique benefits. With friends, gifts can be exchanged and rewards received. Friend options can be located through accessing the button on the right-hand side of the main screen. Selecting this button will bring up the Global Chat and five different menus, one of the menus providing access to the Clan interface. This system is unlocked once the Trainer reaches Level 4. There are three officially supported major operating systems (platforms), namely Android, iOS and Windows while support is also available for Fire OS. In the vast majority of cases, only Trainers on the same platform and server can interact with one another, but there are instances, albeit extremely rare, when cross-platform and cross-server functionality is available. Each operating system has two retail servers, namely apa-gold and eur-gold. However, only apa and eur are shown to the userbase as the suffix is only displayed to the game developers. In order for a Trainer to find their server, they must press the button then go to the menu and then to the menu. The name of the server is written next to Save Data Server. There exists a third server, namely chn-gold (displayed as chn to Trainers), which is available only to Android users in China. Trainers from the same country on the other platforms still make use of the apa server. Trainers can connect their game account to other services in two different ways depending on their platform. All Trainers can connect to Facebook directly from the friend list by pressing the button and then the button, or the button at the bottom of the Dragon-hiring list, or by pressing the button in the top right corner of the screen, choosing the button, then pressing the button. Android users can also connect their game to their Gamer ID, a unique username linked to a Trainer's Google account, by going to the same menu as before and choosing the button. Windows users can connect their game to their Xbox Live account through the same menu by pressing the button. Prior to the release of iOS 10, iOS users could connect their game to Game Center. This app has since been discontinued, but the game can still be connected to it, albeit outside the game, through the device's own settings, and save files can be retrieved from it. Connecting the game to external services allows the Trainer to backup their progress and even link it to other compatible devices. While the latter can also be done through , an option allowing the Trainer to move their progress, it does not provide any progress backup. Regardless of the method chosen, linking the same game progress in multiple places can only be done on the same operating system (platform) and server. Additionally, linking the game to those external services will link the in-game achievements to achievements provided by those services for the Trainer to earn within each of the respective service, but these will not be reflected in the game as they will have no impact on the Trainer's game progress, as only the in-game achievements affect the progress. 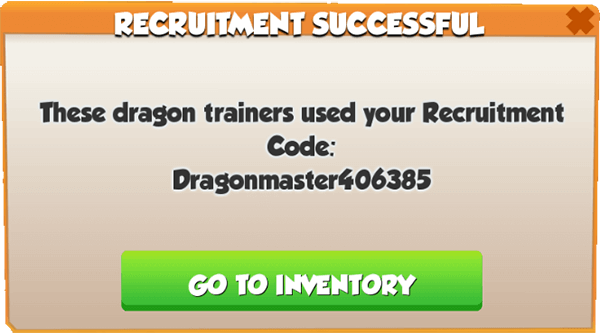 In addition to the above benefits, connecting the game to Facebook will reward the Trainer with 10 Gems and the Prairie Dragon, a unique Dragon that can initially only be obtained in this way, and will allow Trainers to befriend each other in the game, enabling them access to various social benefits. using the Recruitment Code through the button on the friend list. Using the second-last option will offer the Trainer three other Trainers at any given time and the Trainer can visit these Trainers' islands or send them an invitation. When using the last option, the code can be manually inserted or copied from the clipboard and entered through the option. After the code is added, the button must be selected in order to finalize the action. New players can also be invited to the game through, WhatsApp, email and Viber/SMS by selecting the , and buttons, respectively, that appear after pressing the button. All friend requests must be accepted before being reflected in the game. However, entering another Trainer's Recruitment Code in order to gain rewards, will automatically add that Trainer to the friend list as opposed to adding their code through the friend list. Due to the fact that the game does not support the cross-platform and cross-server feature, only those on the same platform and server can become friends. Once a friend has been added, they will show up in the friend list and gifts are instantly made available to send between Trainers. Up to 200 friends will be displayed in the friend list. If there are more than 200 Trainers only the first 200 will be displayed. Determining which friends show up on the list depends on the internal sorting ID of each friend in part. The list will display the friends' avatar (if available), their total amount of Dragons , their DCL points, their level , their VIP Level (if VIP Status is active), the last time they were online, their desired badge, their interaction tag, and the gifting option. The so-called interaction tag represents how often the two Trainers interact with one another. There are three tags, namely Acquaintance, Familiar Face and Close Friend. Only the score from a week before is taken into account towards these tags. In addition to gifting, there is the button that can be pressed to access other options. The first one is the option which allows Trainers to visit each other's islands. The Trainer can also check the profile of the friend through the button and can also pin that friend at the top of the friend list through the button. The friend can then be unpinned through the button. A maximum of 40 friends can be pinned at the top. Using the button allows Trainers to remove friends from their list. However, if the user that is to be removed is friends with the Trainer on Facebook, they must also be removed from the Trainer's Facebook account in order for the friend to disappear from the game. The two remaining options available within the button are the and buttons. The former appears only if the inviting Trainer is in a Clan and it is used to invite other Trainers to the same Clan, while the latter appears only if the inspected Trainer is in a Clan and it is used to see the Clan that Trainer is part of. Trainers can rent their friends' Dragons when battling on the Campaign Map. The option is made available when the Trainer selects the quest they wish to engage. After pressing it, the Trainer will receive a list of their friends' Dragons and they can choose which one to hire through the button, provided they have enough energy to do so and the Dragon has not been rented in the past 24 hours. Friends can also help each other with opening Rusty Gates and with upgrading the Totem of Friendship. Additionally, a visiting Trainer can reduce the timer of an ongoing action by 3 minutes for Farms and 5 minutes for other buildings, up to three times per Trainer, for a total of five Trainers per day, by tapping on said building whenever the icon appears atop the building. This last feature is open even to Trainers who are not friends with each other. Tapping the icon when it is shown at the edge of the display takes the visiting Trainer directly to the next available Boost action. The owning Trainer has to click the boosted buildings afterwards to receive the time bonus. The maximum number of visiting Trainers who can help a Trainer in 24 hours is 10. As every visitor can perform 3 help actions, the Trainer can receive 30 helps per day in total. There is also a feature that allows Trainers to see nearby Trainers by pressing the tab in the friend list screen. From here, the Trainer can visit those Trainers' islands, check their Clan or profile, or send them an invitation in order to add them to the friend list. These Trainers are not necessarily friends of the user, but Trainers in a nearby range of 1, 10 or 100 kilometers. The Social Log keeps track of the latest 20 most important social activities, such as invitations to a Clan, visits, friend requests and help with time boosters from other Trainers. The Trainer information in the Social Log is the same as that in the friend list minus the number of Dragons a Trainer has and the currently-equipped badge. The Trainer can also visit another Trainer or check their profile from here. There is also the possibility of pinning a Trainer to the top of the list, although the Trainer will be pinned at the top of the friend list and not at the top of the Social Log. 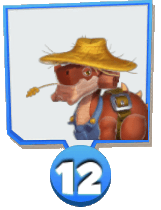 Toby is the Trainer's first friend in the game and the only cross-platform and cross-server friend as he is available to all Dragon Mania Legends Trainers. Toby is not counted among the maximum 200 friends a Trainer can have and he is always shown at the top of the list. 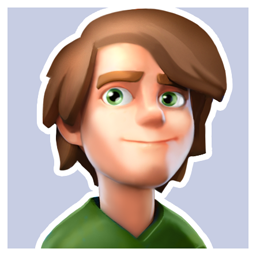 Toby's account is not played by anybody, his progress being updated by Gameloft from time to time for the purpose of displaying new content. The Trainer only has the option to visit his islands, as well as hire his strongest Dragon. Toby can not be removed from the friend list. When opening the first Rusty Gate in the game, one that requires only one friend, Toby will be automatically assigned by the game to help open it. Toby's interaction tag is always Close Friend. Toby's level, as well as his strongest Dragon, depend on the level range of the Trainer. The Player Profile is a feature which displays a vast amount of information about the Trainer, it essentially being an in-game ID. 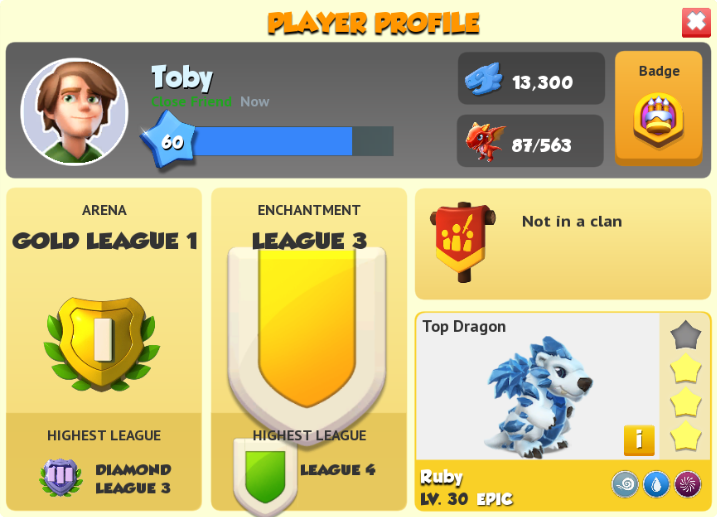 It displays the Trainer's avatar (either the in-game one or the Facebook profile picture), name or nickname, Trainer Level, VIP Level, DCL points, amount of unique Dragons, currently-selected badge (if any), current league in the Dragon League and Enchantment League as well as the highest league in which the Trainer has ever been, Clan name (if any), Clan Coat of Arms, current Clan League, current Clan rank and the top Dragon. The information given about the Dragon is its image, name, level, Enchantment Stars, rarity, Elements and skills. Additionally, in the right of the Dragon, the option can be used to bring up the Base Codex Entry of the Dragon. A Trainer viewing their own ID has the additional options to change their nickname , select an avatar (a mugshot of one of their top 10 Dragons) and check the current and necessary experience through the button. Depending on the visited Trainer's privacy settings, a visiting Trainer might be able to view the ID of the visited Trainer and see when the Trainer was last online and will also be able to befriend the Trainer if they are not already in-game friends. Trainers can receive various notices and requests from other Trainers through the messaging system. Messages are stored under the tab and can be accessed through the main interface of the Friend System. From the messages screen, the Trainer is able to respond in certain ways depending upon the message received. The button can be pressed in response to requests for opening Rusty Gates or upgrading the Totem of Friendship. 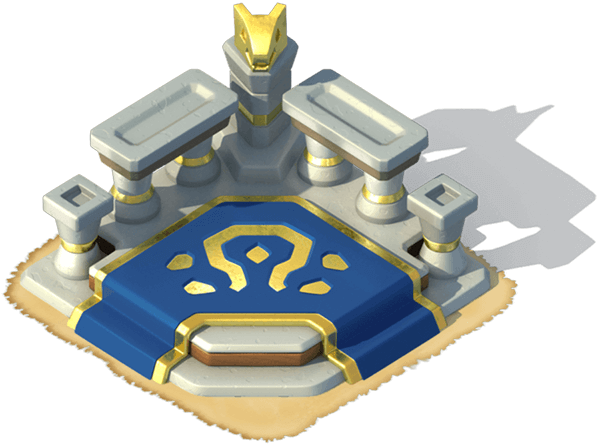 Invitations to a Clan can be accepted using the button or declined using the button. If the Trainer wishes to see more information about that Clan before making a decision, they can press the button. Whenever one of their Dragons is hired by a friend, the Trainer will be notified here and can the friendship points they have earned for this. Finally, Trainers can or requests to add someone to their friend list. These last requests only come from fellow Clan members or users in the vicinity of the Trainer, as friendship requests on Facebook can not be dealt with in the game itself. All messages, with the exception of Recruitment Code rewards and system messages, expire after 36 hours if they are left unclaimed. The user can have a maximum of 200 unclaimed messages. On the friend list, the option appears in the right of each friend, with the exception of Toby. 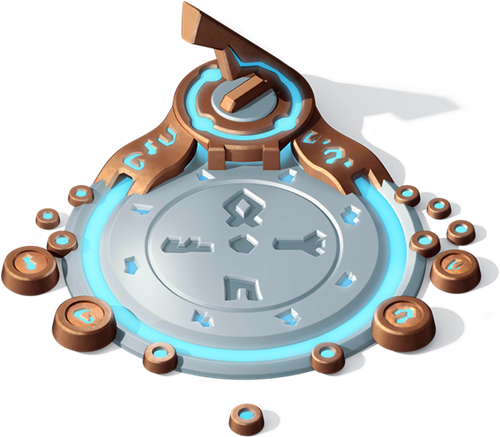 After that button is pressed, a random mystery gift will be sent, out of four available ones; 1 Dragon Piece for the Enchantress Dragon, a Portal Gem, (1,000*Modifier) Gold, or (100*Modifier) Food, with only one to be sent to the given Trainer at a given time. These gifts are not deducted from the Trainer's own stockpile, instead being generated by the game itself. 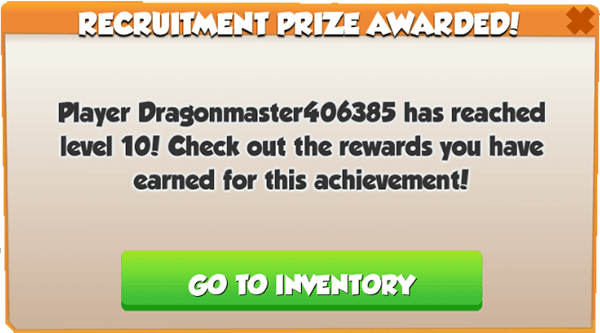 Only 1 Dragon Piece can be received per day. The chance to receive a particular gift depends upon whether the Trainer has already received a Dragon Piece for the day or not. When a Dragon Piece has been obtained, the chance to be gifted Food is 24,44%, the chance for a Portal Gem is 26,67% and the chance for Gold is 49,89%. 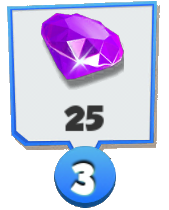 When a Dragon Piece has not been obtained, the chance to be gifted Food is 18,33%, the chance for a Portal Gem is 20%, the chance for Gold is 36,67%, and the chance for a Dragon Piece is 25%. 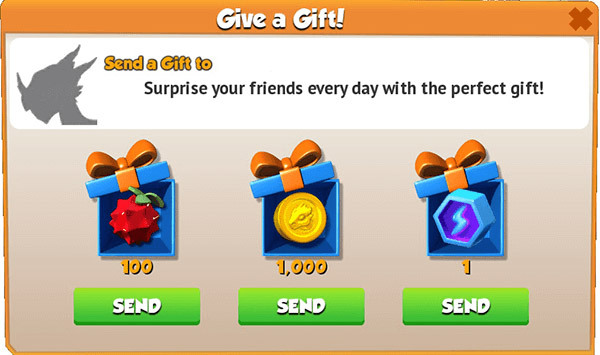 Gifts can only be sent once every 24 hours per friend, however, there is no limit to the number of friends gifts may be sent to per day. 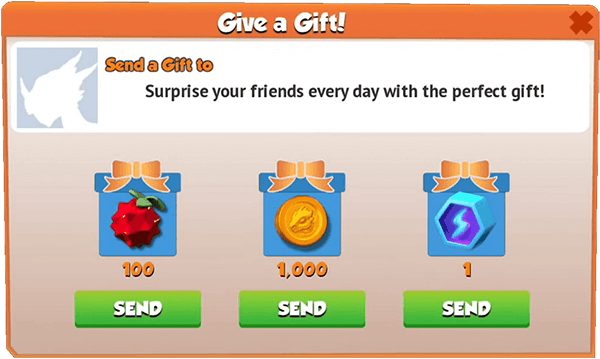 Received gifts can be viewed by pressing the corresponding button in the main interface of the Friend System. The gifts are displayed in order from oldest to newest. The Trainer can claim a maximum of only 100 gifts within a 24-hour period. 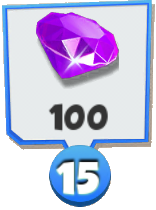 The same limit applies to the number of gifts the Trainer can receive, as the Trainer will receive no new gifts until the reset time if they already received 100. For example, if the Trainer did not claim any gift until the reset period, they will receive absolutely no new gifts after the 24-hour period has passed. Gifts that are left unclaimed for 36 hours will expire. At the top of the Gifts section, a counter is displayed showing the current total claimed and unclaimed gifts separated by a / from the limit of 100. All the gifts can be claimed at once through the button. 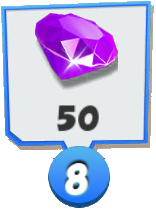 Since the limit of Portal Gems a Trainer can have in their inventory is limited at 200, whenever that limit is reached and a mystery gift is claimed and results in a Portal Gem, the button will be shown under it, indicating how much Gold the Trainer will receive should they press it and proceed with converting the Portal Gem to Gold. Every Trainer has a Recruitment Code which can be used to invite non-playing users to the game and to request the friendship of playing users. Both groups must be on the same platform and server. 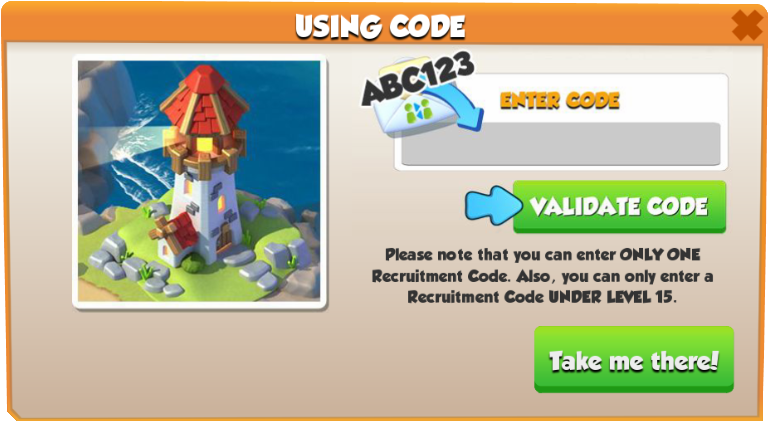 The Recruitment Code window can be accessed from the main interface of the Friend System, or by pressing the button at the top of the friend list, or by tapping the Lighthouse. The Trainer can then choose the button to copy the code to the clipboard and paste it wherever they wish so, or they can choose the option which will bring up several other buttons that are used to send the code to a desired recipient. The button is used to send the invitation code through e-mail, the button is used to send the code through Facebook, the button is used to send the code through SMS and the button is used to send the code through WhatsApp. The first three buttons are available to everyone, except for the SMS button which is not available to PC Windows Trainers, while the last button is available only to Trainers who have WhatsApp installed on their devices. Additionally, Trainers who have Viber installed will also be able to send the code through this application, through the SMS button. 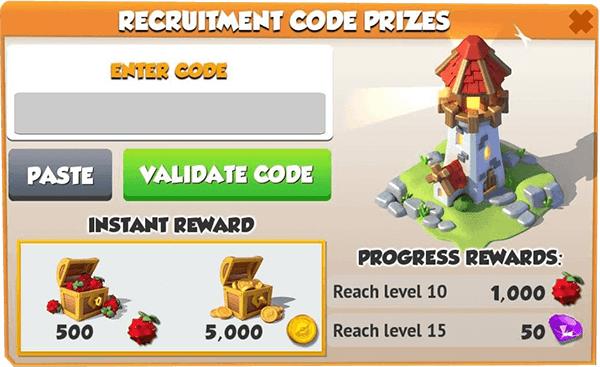 Multiple new users can sign up using the same code, however, only one Recruitment Code may be submitted per person. Whenever the Trainer has their code used by a user who has never entered a code before, a window will pop up informing them which will also display the name of the Trainer who used it. Additionally, a window will also pop up whenever any recruit of the Trainer's reaches Level 10 or 15. Both windows will have the option on them and pressing it will take the Trainer to the inventory. In order for a new Trainer to enter a code , if they have not used one already, they must go under the same tab and press the button, then fill in the blank with the code, either by writing it in manually or by pasting it (after having been previously copied) through the option, and then finally validating it through the option. Trainers who wish to enter a code for the purpose of sending a friend request will have to do so from the friend list. A Recruitment Code that offers both Trainers rewards can only be used by new Trainers who are Level 4 or above, but no higher than Level 15. 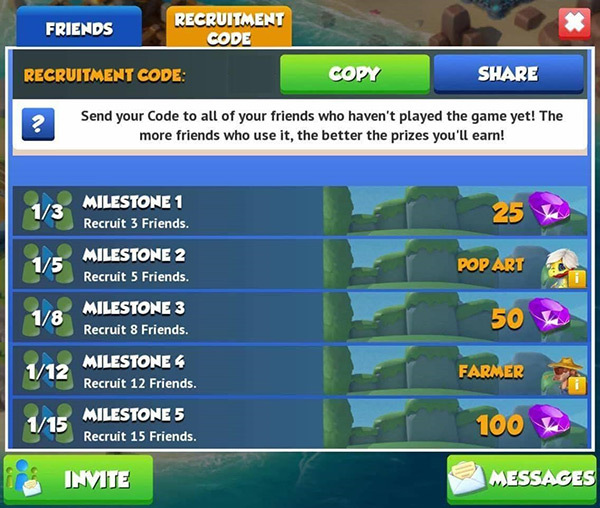 Recruitment Codes for friend requests can be used at any level. Trainers can not use their own, personal codes, thus they must use another Trainer's code. Once the invitation is successfully accepted by the recruiting Trainer, the Trainers will become friends in the game and both of them will receive compensation for using the code. The rewards will be given regardless of whether the recruiting Trainer accepts the friend invitation or not. The recruited Trainer will receive a welcome basket of (500*Level Modifier) Food and (5,000*Level Modifier) upon entering the Recruitment Code, 1,000 Food upon reaching Level 10, and 50 Gems upon reaching Level 15. The Trainer whose code was used will receive up to five milestone rewards depending on the number of people who have used their code. Additionally, the latter Trainer will also receive (500*Level Modifier) Food and (5,000*Level Modifier) Gold for each new recruit, (1,000*Level Modifier) Food when the recruit reaches Level 10, and 10 Gems when the recruit reaches Level 15. Under the same tab where the Recruitment Code is, the Trainer's progress toward the five milestones can be seen, as well as the progress of the recruited Trainer. Trainers who have already used a Recruitment Code for the purpose of receiving rewards will not receive additional rewards for each new code they enter. Additionally, codes used by these Trainers will not count toward the amount of recruited Trainers of the Trainer whose code was used. Due to the fact that the game is not cross-platform and cross-server, the code can only be used between Trainers sharing the same operating system and server. The Dragon Collector Leaderboard is a permanent, global, prizeless leaderboard in which Trainers on the same platform and server are ranked in accordance to the collective sum of their current Dragons' Dragon Collector Points . The leaderboard is intended as a Hall of Fame for Trainers with the largest collection of Dragons. The leaderboard is accessed through the main interface of the Friend System. Inside this screen, the Trainer can see their current position on the leaderboard, as well as the position of other Trainers, the total amount of points the Trainer and the other Trainers have and the obtainable progress rewards. The Trainer can also choose to filter the Trainers on leaderboard by all through the and by their friends through the button. A notification is shown in the middle of the screen whenever a new milestone is reached for the very first time. For example, a non-enchanted Level 50 Mentor Dragon will have a score of 350 : (Epic [100 points] * Enchantment Level 0 [1 point]) + Dragon Level 50 [50 x 5 points] while a Level 100 Zeus Dragon with Enchantment Level 2 will have a score of 960 : (Divine [400 points] * Enchantment Level 2 [1.15]) + Dragon Level 100 [100 x 5 points]. Duplicate Dragons of a species are not counted toward the Trainer's collective sum, thus only the Dragon with the highest DCP of that species will be considered for the total amount. Additionally, Clan Dragons and Chronos do not benefit from the DCP. While the leaderboard itself does not offer any prizes and is merely a display of status, Trainers do receive different rewards when they reach certain DCP milestones. Any of these rewards can be obtained only once, meaning that if a Trainer's score has decreased beyond an already-reached milestone, no reward will be given after reaching that milestone once again. The Global Chat was disabled as of 19 March 2019 to undergo revamp. The color scheme of the chat was changed once again. The Trainers now have the option to disable the chat. The button was replaced by the and the was replaced by the button. The busy fellow tag for friends was changed to acquaintance. The option of accessing the entire Friend System through the Lighthouse has been discontinued, meaning the only way to access the system now is through the button on the right-hand side of the screen. 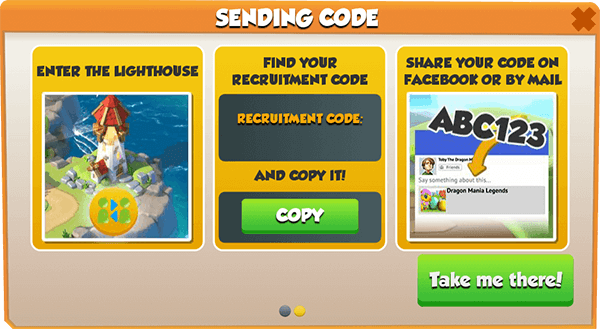 Selecting the Lighthouse will now bring up only the interface for the Recruitment Code. The color scheme of the Global Chat was overhauled and the feature is now automatically displayed when opening the Friend System interface, thus discontinuing the tab. All the main tabs have been replaced with large, square buttons. The Clan interface can now also be accessed through the Friend System. The Suggest Friends feature is now available to any Trainer and no longer only to Trainers with 10 or fewer friends while the button was replaced by the button. Trainers can now see when any of their friends was last online. Trainers can now help five friends per day with an up to 4-minute time reduction. The , , , and buttons have all been replaced by the , , , and buttons, respectively. The tab was discontinued. The Player Profile and the Social Log have been introduced. Trainers can now pin any of their friends at the top of the friend list. The Gifts and Messages tabs have now been separated from the inventory and the option to access the Gifts tab from the friend list has been discontinued. The Mentoring Program was discontinued, meaning that all social actions related to this program, including the button, were discontinued. Support for MSN accounts was dropped, meaning Windows Mobile users can no longer connect their accounts to the game. The Dragon Collector's Leaderboard was introduced. The possibility of inviting new Trainers to the game through SMS, WhatsApp and Viber was implemented. The and buttons have been discontinued and the Friend System interface will show up instantly when selecting the Lighthouse. 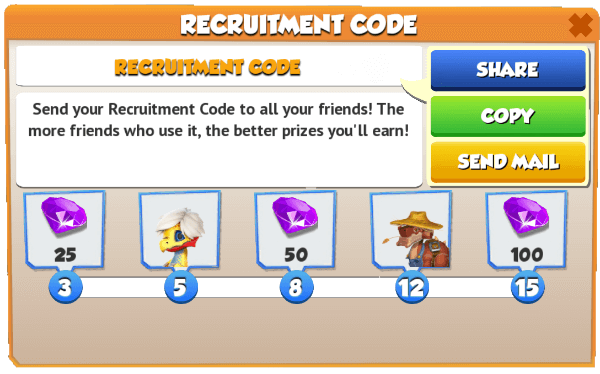 Recruitment Codes can now be used more than once for the purpose of adding friends. 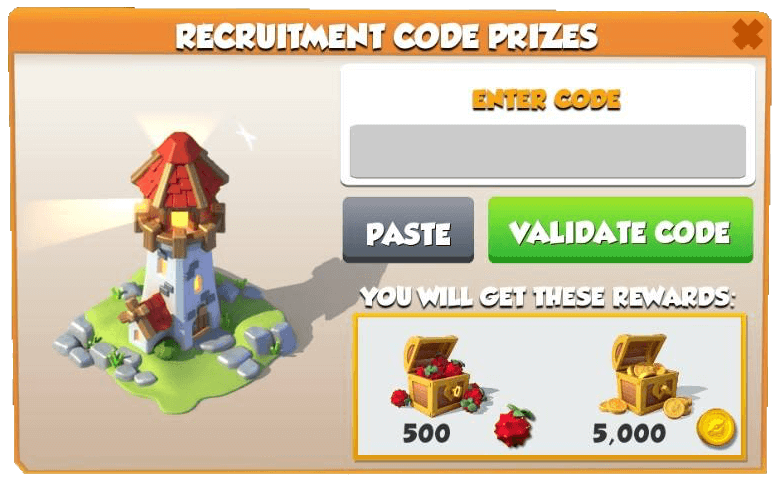 The graphics for the Recruitment Code screen, along with the related windows, were altered while the tab was replaced by the tab, the button was replaced by the button and the button was replaced by the button. Additionally, for the same feature, the button was introduced and appears after pressing the button. The chn server was introduced, being exclusive only to Android Trainers in China. The possibility of claiming all gits at once was implemented. The numbers in the "near me" section, which represented the "Dragon power" of the user (a combination of the Dragons owned, their levels, and their skills) was removed. The Trainer can now befriend other Trainers inside the game, through the Near Me section. The game can now offer friendship suggestions through the button. Befriending Trainers by inviting them through mail was discontinued. Messages have been slightly reworked and now include more information. Xbox Live support was dropped for Windows Mobile, meaning mobile users can no longer connect their game to a Xbox Live account, but, instead, they can connect their account through MSN through the newly-introduced button. Additionally, support for Windows Phone 8 was also discontinued. The level of Toby's Titan Dragon was decreased from 22 to 18 and the level of his Pulsar Dragon from 18 to 16. The former received two Enchantment Stars while the latter received one. The length of the friend list window was expanded allowing for a quicker gifting. Matching pieces for the Enchantress Dragon were introduced as a new gift. Trainer can no longer choose what to gift, making the gifts random, thus the gifting screen has been discontinued. A tab has been added to the inventory. With the latter being introduced, gifts are now being sent there instead of the tab. Additionally, gifts are now listed from oldest to newest instead of newest to oldest. Support for Google+ log in has been dropped and replaced by the option to sign in and play using the new Gamer ID, a unique username linked to a Trainer's Google account. This means Trainers can no longer befriend themselves through Google+. Thus, the button was dropped for Android Trainers, along with the button (the latter for everyone) and both were replaced by the button that was previously used only by iOS and Windows Trainers. The graphics for the Recruitment Code were altered level-progression prizes were introduced for both the invited and the inviting Trainer. Thus, starting with this update, both Trainers receive additional rewards when the recruited Trainer reaches Level 10 and 15. Prior to this update, the invited Trainer received only a welcome basket of (500*Level Modifier) Food and (5,000*Level Modifier) while the inviting Trainer did not receive rewards based on the level progression of the person they recruited. The button was replaced by the button while the button was discontinued. Update 2.2 dropped support for Game Center, due to the app being discontinued with the release of iOS 10, thus friends can no longer be added in this way. Any friends who were added before it was discontinued remain in the Trainer's friend list unless they are removed. The option to send friend requests to Clan members without having to befriend them outside the game was added. Support for tvOS was dropped. Support for the Fire OS platform was implemented, bringing the total number of separate platforms to four. 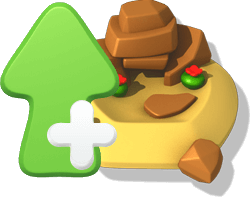 The button along with and buttons were introduced, the latter two being part of the Clan feature added within the same update. Both were consolidated under the former button, along with the and the buttons, the latter having replaced the old button used for deleting friends. A 36-hour expiry limit for unclaimed messages was introduced and the friend list was capped at 200 friends. The option to remove friends from the list was introduced. Support for tvOS was introduced. The -gold suffix was introduced for retail servers. Friend Codes were renamed as Recruitment Codes and the button was replaced by the button. The gifts sent to friends were scaled to be in accordance to the receiving Trainer's Level. 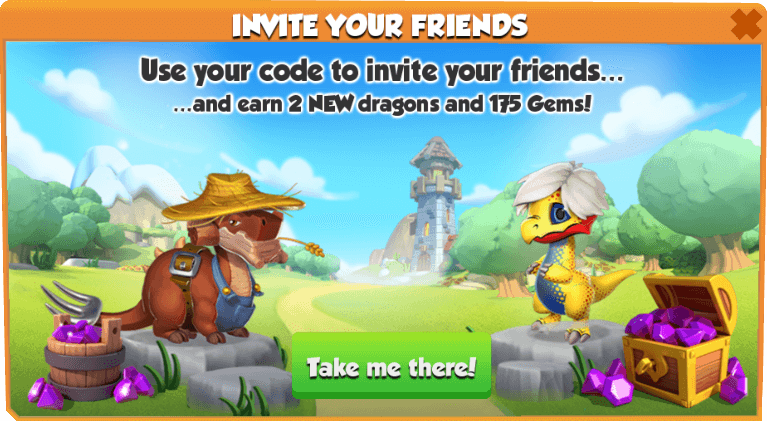 Referral Codes were renamed as Friend Codes and the button was replaced by the button. The Near Me section was added to the friend list. 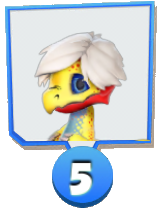 An image of a baby Fire Dragon was added next to each friend's name (except Toby) indicating the total number of unique Dragons the Trainer currently has. Referral Codes were introduced. Only Trainers who have downloaded the game after this update are able to enter another Trainer's code. Additionally, the was introduced at the bottom of the friend list as part of this feature, and it is used to access the Referral Code directly from the friend list. Starting with this update, Windows Trainers can connect their game account to an Xbox Live account. The , and buttons have been replaced by the , and buttons, respectively. Slight graphical alterations were made to the gift boxes behind the gifts. 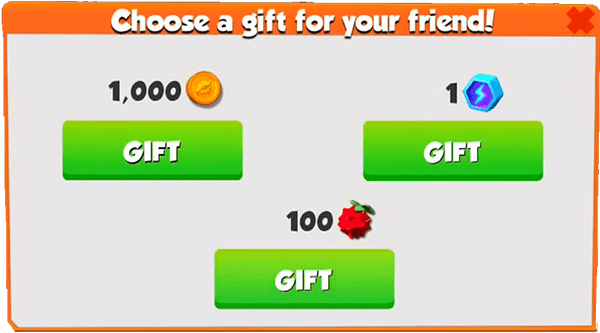 Graphical changes were brought to the gifting screen that appears when pressing the button on the friend list. Each gift is now displayed over a blue gift box background and the avatar and name of the gifted Trainer are now shown. Additionally, the Gift button inside this screen has been replaced by the button.